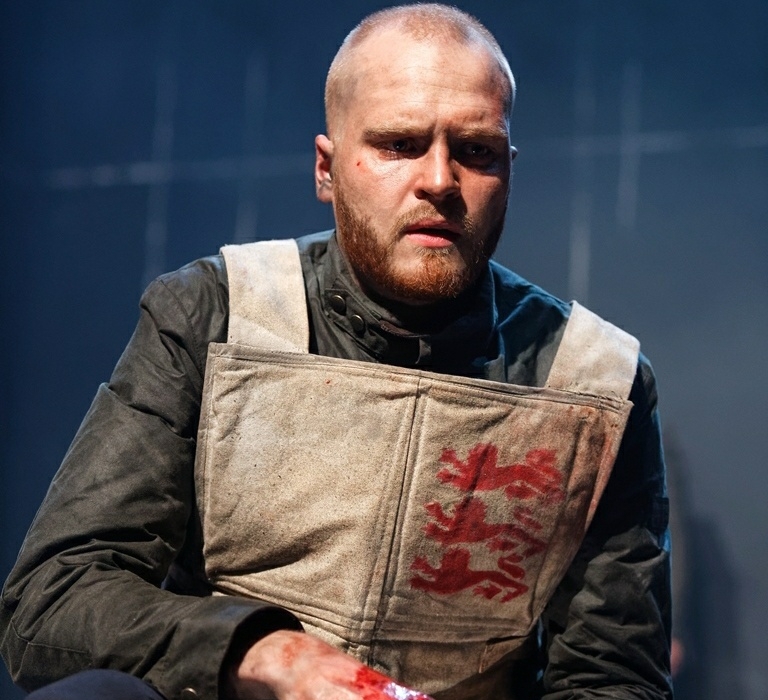 Ahead of The Tobacco Factory’s upcoming show at The Dukes in Lancaster, I had a chat with Ben Hall (Henry V) and Heledd Gwynn (Katherine the Dauphin) about their roles in this exciting new production. So Ben, what can audience members look forward to from The Tobacco Factory’s production of Henry V? I think they can expect a different take on the Henry V story. A very grounded truthful interpretation, filled with quiet personal moments as well as the epic. What challenges did you face in staging this play and how did you overcome them? And how does production in the round change things? The challenges with staging any play are to make sure the story is told clearly, and that little character beats can be seen. Elizabeth (our director) was always very keen that the staging remained fluid, so we didn’t feel stuck. This made it much more comfortable when moving from end on in Bath to the round because we thought we could play with it and discover for ourselves what worked and what didn’t. The chorus help you (the audience) as well in imagining the bits you can’t see, they really bring this to life, and it makes the battles easier. Henry V has often been viewed through the lens of contemporary events. What relevance does this play have today do you think? I think this play is always going to be relevant while we have the powerful ruling over the powerless. And especially now, I think it’s important to hold a mirror up to what patriotism means and why it can be astonishing but also dangerous. Some productions present Henry as a brave and pious hero, others as a ruthless Machiavel. How did you arrive at your version of the king? Shakespeare has written a wonderfully complex character, so I think he can be all these things depending on the situation. I wanted to explore what power and kingship can do to someone mentally and was keen to explore how that changes through the play in his decision making. There were always two big questions I had to ask myself. When is Henry the man rather than the king? And can you be a king and forever be considered a good person? Has embodying this tension between what’s morally right and successful kingship changed your perception of what it is to be a leader? The main thing is, I would never want to be one! The pressure to always make the right decision, as well as knowing that you are never going to be able to please everyone. Such responsibility would be way too much for me to handle, and when it comes to war, I would never want to be the one that sent people to their potential death. There are no real victors in war; everybody loses something. And Heledd, Princess Katherine is a crucial figure in history but has a limited role in the play. Have you taken any steps to redress this imbalance? We have indeed. As you say, Katharine’s role is usually limited, and her scenes have become known for their ‘light relief’. She appears as a bystander with almost no say in her fate. Elizabeth decided to conflate Katharine’s role with that of the Dauphin – the heir to France, allowing her to lead her country into battle with England crucially. This change not only gives her status and a more vocal role, but she becomes a true obstacle and challenger to King Henry’s claim to France. With her own and her country’s future at stake, she has everything to lose – and fight for. For tickets to Henry V, head to www.dukes-lancaster.org.